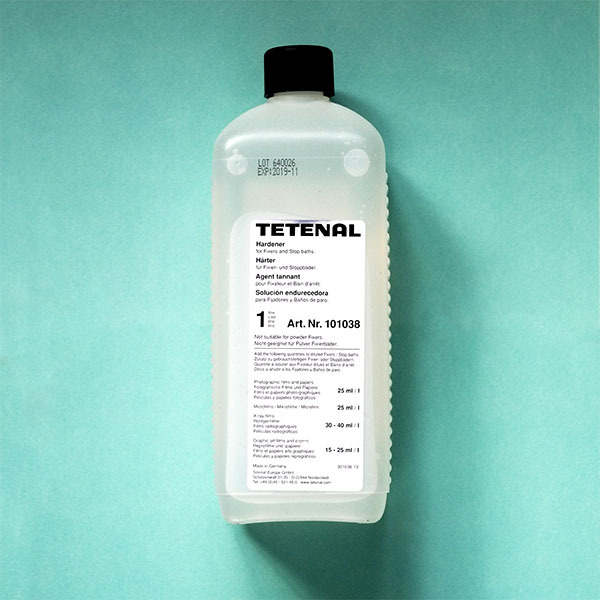 Tetenal Hardener is a liquid hardener for use with fixers and stop baths. This product will harden the surface of the photographic material being developed. Hardener is particularly useful when used with soft emulsions. For example, when developing old film stocks or using photographic emulsion. This is not suitable for use with powdered fixers. To prepare your hardener, dilute 1+39. That means one part hardener to thirty-nine parts stop or fix. The dilution is the same for both paper and film. Only mix hardener with already diluted fixer or stop. Make sure you mix together thoroughly before use.